"ROUSH Performance is a name synonymous with aggressive, well-built, powerful Ford vehicles. But it isn’t just ROUSH Mustangs that we create – meet the 2016 ROUSH F-150." The 2016 ROUSH F-150 SC keeps true to the promise of being a true off-road performance vehicle. The vehicle takes Ford's new aluminum-bodied F-150 truck, and enhances it with a host of body components, ROUSH graphics, a ROUSH Side-Exit Exhaust System, and interior components including ROUSH Molded Front and Rear Floor Liners from WeatherTech to keep your carpets clean, and a serialized ROUSH console badge to document the F-150’s ROUSH bloodlines. Additionally, ROUSH has teamed with FOX to equip the ROUSH F-150 SC with a 2.0 Performance Series Suspension System featuring Coilovers and Shocks with Boots. ROUSH 20-inch Wheels wrapped in Mickey Thompson® Baja ATZP3 305/55 rubber sit in all four corners, and Locking Lug Nuts with a Key Bag are included. 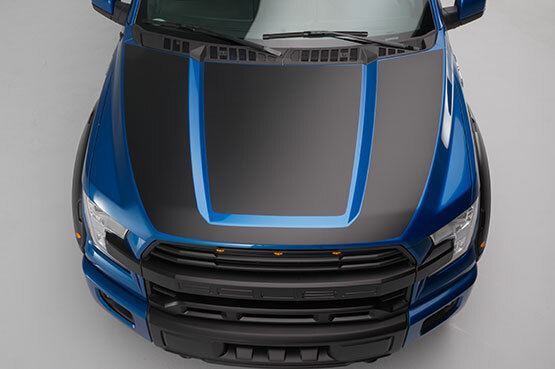 The 2016 ROUSH F-150 SC is equipped with a number of appearance upgrades including a ROUSH Front Grille with Clearance Lightning, a ROUSH Front Bumper Cover, ROUSH Fender Flares with Clearance Lighting, a square "R" Hitch Cover, and a ROUSH License Plate and Frame. An aggressive ROUSH Side-Exit Exhaust System has been added to provide that deep signature rumble craved by ROUSH enthusiasts. ROUSH exterior upgrades are precision-engineered with CAD/CAM design, and manufactured with the same processes that automotive manufacturers use for OE-quality appearance, longevity, and fit. At ROUSH Performance, it's not enough to deliver heart-pounding performance, unparalleled refinement, and off-road ability. We take a step further and back-up the 2016 ROUSH F-150 SC with an industry-leading 3-year, 36,000 mile limited warranty to show you that we are with you on this ride.